VIFF 2017—Set in two distinct but wholly child-focused timelines fifty years apart, Todd Haynes' latest film is a whimsical tale of family, mystery, and discovery based on The Invention of Hugo Cabaret author Brian Selznick's immersive novel of the same name. Wonderstuck uses deafness and childhood adventure to expertly tell stories of young loneliness. 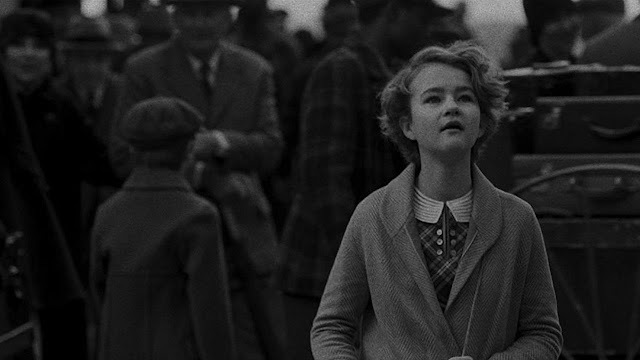 Deaf actress Millicent Simmonds and Oakes Fegley star as Rose and Ben in 1927 and 1977, our mirrored protagonists who set off on their own journeys of self-discovery while dealing with hearing loss. Simmomnds is so expressive and whimsical struggling as her Rose to communicate with others. She's simply marvellous to watch filmed in glorious black-and-white photography. The talented Fegley is levied with some tough material having to act out, grieve, and suffer through difficult exposition. However, we clearly believe his anguish and desperation for family. Julianne Moore and Michelle Williams play somewhat mysterious yet obvious cyphers mostly existing in memories of the past. Moore plays two different key roles that shift the rising narrative and bind the two seemingly unrelated parallel stories together. It's hard not to want so much more from these immensely talented actresses who used purely to motivate the kid roles and flesh out the layered sense of long-held family histories. Full of odd contrivances, situational coincidences, and a too neatly wrapped up story, Wonderstruck doesn't have quite the same magic as Spielberg's nostalgic Amblin films—clearly, an influence here. The central, supposed mystery scripted by Selznick himself never feels quite that mysterious. Full of museum history and treasure hunts, the highlights are the childhood adventures at New York instutions cut back and forth beautifully captured by cinematographer Ed Lachman. Simply put, the sound design and subtle music composition from Carter Burwell are splendid in getting across the alternate methods of communication the deaf characters experience with long stretches of silence that might bore some. Exasperated yelling, writing notes, and other ways of speaking are highlighted so vividly and cinematically. Wonderstruck a stirring tale of childhood curiousity and wonderment revolving around mothers. Haynes and his cast of child actors express a deeply earnest, sentimental, and uncynical story of self-discovery. The creativity used to tell centred on deafness, artistry, and history make the film all the more emotionally resonant. Wonderstruck screened at the closing gala of the 2017 Vancouver International Film Festival as part of the Panorama stream.